Smith doesn't assign any person or party as righteous or villainous, nor does she assign us, the audience, to any particular faction. She integrates us into the whole of Roman (and Volscian) society. Saturday, February 10, 2018, one side of theater-in-the-square. 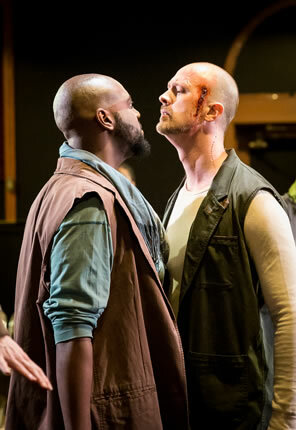 Caius Martius Coriolanus (John Stange, right) goes toe-to-toe with Tribune Sicinius Velutus (Anderson Wells) in the Brave Spirits Theatre production of William Shakespeare's Coriolanus. Below, Robert Pike as Tullus Aufidius. Photos by Claire Kimball, Brave Spirits Theatre. Odd: the doors to the theater don't open until 8 p.m., when the play is supposed to start. Must be one of those enter-into-the-action stagings, which makes sense for a play like William Shakespeare's Coriolanus. So, I make a last-minute restroom run, and just as I get back to the crowded room that serves as the box office, snacks counter, bar, and lobby for Brave Spirits Theatre at The Lab at Convergence in Alexandria, Virginia, a commotion is starting. Angry people are milling about, muttering something about corn. They become increasingly hostile. "Before we proceed any further, hear me speak," one yells, and now these people in postapocalyptic clothes and black-streaked makeup on their faces are complaining about being hungry and contemplating killing one Caius Martius. I feel a hearty clap on my shoulder; it's Menenius, who walks past me and shouts down the rest. He's shortly sitting on a chair in the middle of the lobby, telling the parable of the belly. Caius Martius himself enters next and insults the crowd before announcing that the rebelling people have been granted two tribunes to represent them in the senate. This makes the angry citizens happy, more so as they hear, specifically, that Junius Brutus and Sicinius Velutus were the ones named tribunes. That's good news to them. Then comes word that the Volscis are mounting an attack on Rome. That's good news to Martius. The demonstrators slip away, and Martius and the other nobles head to the Capitol, Martius pausing at the lobby door, turning to us theater patrons, and ordering us to "Pray, follow." We do, but we encounter Sicinius and Brutus in the hallway to the theater. They are discussing their concern about Martius and what his hatred for the common people portends for Rome. "Let's along," Brutus says, opening the door to the theater and ushering us in. We enter to chants and the sounds of pikes banging floors and radiators. The play space is 58 chairs set up in a square. We grab two seats next to a woman stitching a pair of pants. We've barely settled when Aufidius begins talking to the Volscian senators at the other end of the room. The play's entire first scene having been enacted in the lobby and hallway, the in-your-face energy we experienced out there continues in here as the action unfolds before us, behind us, beside us. That woman stitching next to me is Virgilia, and she stays there through most of the next several scenes, even speaking her lines to Volumnia and Valeria while stitching those pants in that seat. 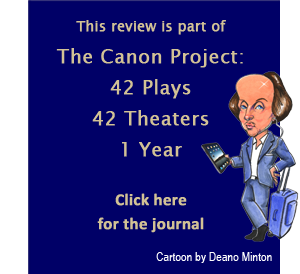 Fourth-wall-shattering theater is no longer a novel concept, though the large number of companies that still strictly adhere to proscenium arch conventions might make you think otherwise. Fourth-wall-shattering was the accepted concept in Shakespeare's time. These days, though, the exercise is often theatrical calisthenics, an aren't-we-cool aesthete—gimmickry. Brave Spirits Artistic Director Charlene V. Smith, who helms this production of Coriolanus, does not indulge in gimmickry. She explores Shakespeare's texts with both a trust and openness that results in some of the most theatrically stimulating Shakespearean experiences I've known. She does so again with this Coriolanus. This is a play of the people. Literally: the word people is spoken more than 80 times. It's used with both positive and negative connotations, as a badge of honor and an entity to scorn. Nevertheless, this play is peopled with equal representation from all classes and different countries, too. Coriolanus has famously been staged as an exemplar for political positions across the entire spectrum of ideologies, from communism to fascism. Aware of that, Smith doesn't assign any person or party as righteous or villainous, nor does she assign us, the audience, to any particular faction. She integrates us into the whole of Roman (and Volscian) society. In that opening scene in the lobby, the rabble direct their distrust at us, Menenius directs his parable at us, Martius directs his scorn at us, and the two Tribunes engage us in their concerns. Which side are we on? Everybody's. We are back in the marketplace, aka, the lobby, for the intermission, the first-half ending with Martius's exile. Again, the action comes to us, this time Volumnia and Virgilia with Menenius happening upon the two Tribunes standing among us (Martius's departure from his tearful family has been cut in this script). Menenius is last to leave and asks us, “Will you along?" but again we are stalled in the hall, this time by Nicanor and Adrian. Raise your hand if you know who Nicanor and Adrian are (they aren’t even listed in the program). They are the spies (one a double agent in Rome) meeting somewhere between the two nations and reporting on the news in each. It’s a bit of backstory most productions cut as superfluous, but its inclusion here (even at the expense, perhaps, of Coriolanus's departure scene) lets us know that even before Martius joins with Aufidius, Rome is in trouble. Menenius and the Roman government predicted that would happen, fully aware of Volscian behavior, but the Tribunes and the people pooh-pooh that intelligence. The fact that this scene is enacted in this crowded hall—I can’t even see one of the characters—makes us complicit in this espionage happening openly among us. That all the characters come from among us is an obvious thematic ploy, but this Coriolanus also uses more subtle visual and aural hints to ride Shakespeare's allegorical arcs. As Aufidius addresses the Volscian senators, they stand in the pose of effete noblesse, the right hand's fingers hovering around the lips, the right elbow resting in the palm of the left arm crossing the belly. Forgive the stereotype, but in my notes I write "the Volscis are French in posture," probably because I've seen the French in Shakespeare history plays played this way. However, the Roman senators in this production are played this way, too. More to the point, the Tribunes in the second half of the play, after Martius's exile, also pose in this manner. Despite being "of the people," they have taken on the airs of the patricians, and thus initially treat the news that Martius is leading the Volscis on a new invasion of Rome with the order to whip the messenger. In another example of fundamental human behavior trumping ideological standing, the Volscian citizens in the final scene behave exactly as the Roman citizens do in their rabble-rousing moments—"the people" are delineated in label alone. Coriolanus is stocked with animal imagery, and this is exemplified in the players' behaviors. The Roman generals are wolves, Volumnia (Jessica Lefkow) is a lioness, Menenius (Ian Blackwell Rogers) an owl, the mobs are hyenas, and the Tribunes (Anderson Wells as Sicinius, Diane Curley as Brutus) begin as seagulls, become eagles, and end as pigeons. Aufidius (Robert Pike) is a cobra, coiled and hissing with danger. This is particularly disconcerting when, for the second half of the play, he is seated next to me instead of Virgilia, and I can sense the seething volatility coursing though his sinews and ready to explode at any second. Caius Martius Coriolanus doesn’t have a species tag. John Stange brings little more than sufficient line readings to the part. Instead of being the outsized force that drives the play, the action seems to be happening around and to him. He’s overwhelmed by it all, which works effectively in the moment of his exile and Aufidius embracing him afterward, but comes up short in the opening scene (in which he’s pretty much lost among the lobby crowd) and the war. 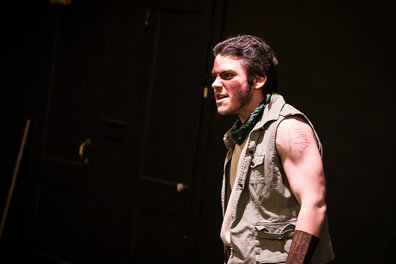 Henry Kramer playing Young Martius, Coriolanus’s son, displays an enfant terrible rage (a wolverine), and though Volumnia says it’s “one o's his father’s moods,” we never see anything close to that mood in the father. Whether or not this reading of Martius is intentional in the production’s we’re-all-one-population concept, it creates a dramatic vacuum in this otherwise breathtaking staging. Breathtaking in its pace, the scenes slipping from one to the next as the actors burst from the sides or from their seats into their first lines and responses. Breathtaking in its action, the milling rabble, the battling armies, the angry Volscian mob tearing Martius to pieces in the final scene. Breathtaking in its proximity. That has something to do with the seats we chose by happenstance. The mob attack on Martius takes place in our corner of the play space, as does the fight at Corioli between Martius and Aufidius. The choreography and execution of these stage combat scenes are so good that it looks real just five feet from us, including the eye gouging and punches (yes, I sometimes felt I had to duck a knife thrust, but it didn’t come near equaling the danger I felt merely sitting next to Pike’s Aufidius). This proximity may be our happenstance, but Smith manages the staging with meticulous theming. The Corioli battle ends with the two armies pulling Martius and Aufidius apart, further enraging both. In a subsequent scene, Martius, back in the Roman camp, is kneeling to wash his wounds. Pike’s Aufidius, back in the Volsci’s camp, kneels opposite Stange as he looks forward to their next encounter: "Where I find him … would I wash my fierce hand in's heart." When next he finds Martius, though, it is in Aufidius’s home as an exile from Rome, and his fierce hands instead embrace his mortal enemy as an ally, their heartfelt respect expressed as a macho bro-love tussle nearly as energetic as their lethal fight at Corioli (and in the same quadrant of the play space). At the end of that tussle, they end up facing each other on their knees. Breathtaking, too, is the acting. Rogers delivers a piercingly nuanced performance as Menenius, the wise old owl, both genial and arrogant in the same pose but nevertheless a powerful bird of prey. Every bit the effective politician, he can advance patrician policy while placating a rioting crowd (the only entity he can't corral is Martius). Renea S. Brown brings a calm dignity to the role of Virgilia, Coriolanus’s wife. She is not cowed by her mother-in-law and, in fact, rules the household with her quiet pride and zen determination. When Martius returns home from his conquest of Corioli, Lefkow’s Volumnia dominates the scene with her prating welcome, but Stange’s Martius looks beyond her to Virgilia. “But O, thy wife,” Volumnia says and, suddenly realizing her place, steps aside. Stange’s Martius shows deep affection for Virgilia; the consequence of excising his departure scene is losing another such moment with Brown’s Virgilia. Lefkow is otherwise a regal fortress as Volumnia, exuding emotional strength in her stillness and roaring when she must. However, in her climactic supplication speech, she goes quiet, a decibel above a whisper as she concludes with "I am hush'd until our city be a-fire, and then I'll speak a little.” She actually delivers this while glaring at Aufidius, who still stands still before her while her son has turned away. I can't see Pike's face but I suspect his Aufidius doesn't dare move before this lioness until Martius breaks the spell of the moment relenting to his mother, whereupon the cobra backs up to coil again. As strong as she is as Volumnia, Lefkow is at her most dangerous when she’s part of the mob and brandishing one of the metal folding chairs like shark jaws. Here she is one element of “the People” (Lefkow, Brown, Pike, Kramer, James Allen Kerr, Thomas Shuman, and Tori Boutin), essentially a single character comprising singular individuals in manners, voices, and intensity.